Michael A. Bailey is the Colonel William J. Walsh Professor of American Government in the Department of Government and McCourt School of Public Policy at Georgetown University. Bailey teaches and conducts research on American politics and political economy. His work covering trade, Congress, election law and the Supreme Court, methodology and inter-state policy competition has been published in the American Political Science Review, the American Journal of Political Science, the Journal of Politics, World Politics, the Journal of Law, Economics and Organization and elsewhere. He is the author of two statistics books. The goal of these books is to get to interesting and useful statistical material as quickly as possible. To be useful, the books focus on endogeneity (“correlation is not causation”) and to be interesting, the books quickly start using real data sets to answer important questions. The books are quite similar. Real Stats focuses on political and policy examples. 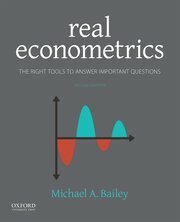 Real Econometrics focuses on economic and policy examples. Bailey is also co-author with Forrest Maltzman of The Constrained Court: Law, Politics and the Decisions Justices Make from Princeton University Press. Bailey received his B.A. in Government and Japanese from the University of Notre Dame and his M.A. in Political Science, M.A. in Economics and Ph.D. in Political Science from Stanford University. As a former Monbusho Scholar at the Graduate Institute for Policy Studies (then at Saitama University) in Japan, Bailey is conversational in Japanese and interested in Japanese politics.